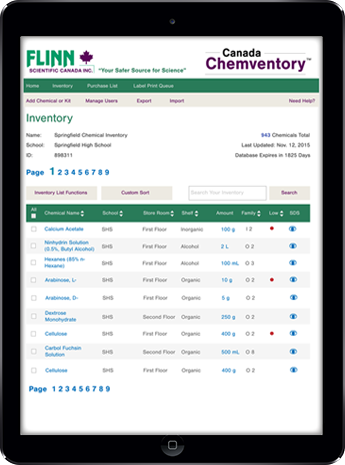 Flinn Canada Chemventory™ is a cloud-based inventory system for laboratory chemicals that enables multiple users to access a single chemical inventory database from multiple locations and multiple devices! Maintaining an accurate chemical inventory has never been easier, more flexible, or more convenient. Add any of our 27 demonstration kits to your inventory list. Search all of your database and also the Flinn master chemical list. The program comes fully loaded with GHS pictograms, hazard codes, and signal word information for over 220 Flinn chemicals and 1,800 additional generic chemical listings. Build your inventory by selecting from a list of Flinn chemicals, generic chemicals, or add your own chemical information manually. Now you can build an inventory database for your school and invite other teachers, lab assistants, and administrators to join for free. Best of all, we have included a GHS label printing feature in Canada Chemventory. Print a GHS-compliant label for any Flinn chemical listed in your inventory or any of our 200+ Flinn chemicals listed in the program. You can also take advantage of our chemical solution label printing options to easily keep track of all the solutions you prepare in your lab.